In the ever-changing world of SEO, there is one thing that remains the same: the importance of keyword research. Understanding what your audience is looking for and how to cater to those searches is just as crucial as it ever was, if not more. The way users are searching has evolved over recent years with short-tail keywords giving way to more specific, long-tail queries thanks to the rise of voice search. The likes of Google Autofill also make it easier for users to look for longer keyphrases without even having to type the whole thing. As such, the way we conduct keyword research needs to follow suit and identifying long-tail keywords is vital for a successful SEO strategy. 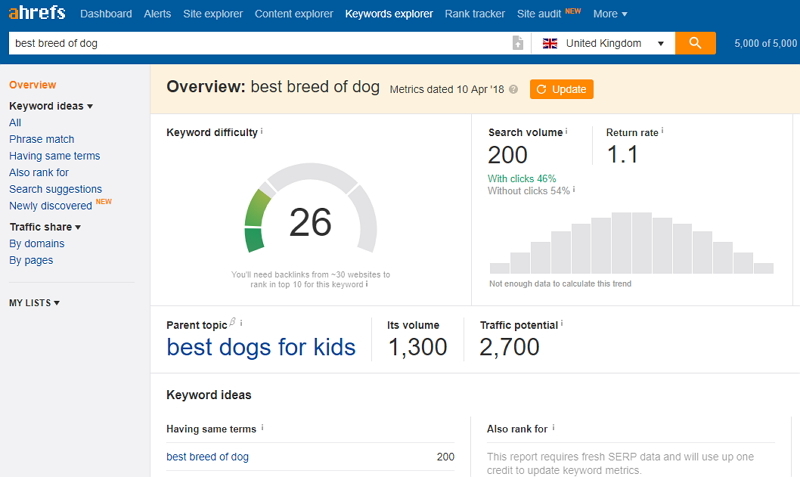 Luckily, there’s no shortage of keyword research tools out there to help us – here are some of our favourites. Arguably the go-to keyword research tool, Keyword Planner has recently been overhauled to present a slicker version for users. Though it requires an active AdWords campaign to provide the most accurate data, it still provides ranged search volume and offers a host of related search terms. For those with an active spend, Keyword Planner is hard to fault when it comes to conducting keyword research. As its name suggests, it is primarily designed for paid advertising, but it is also great for finding keywords to target organically. 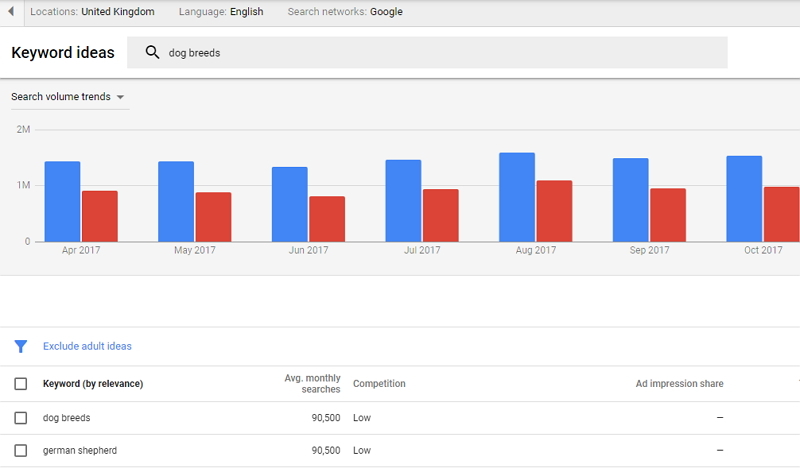 To get started, simply search for a keyword and you’ll be met with the average search volume for that term over the last twelve months. This is useful for spotting peaks and lulls, as well as seasonality trends. You can change the date range to your liking, from the last month to all available data, as well as the search volume breakdown by platform and location. The best part of Keyword Planner is the amount of related search queries it provides – perfect for generating content ideas. 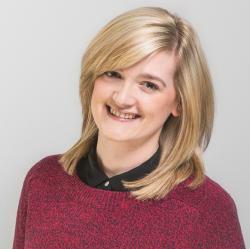 Doing exactly what it says on the tin, Keyword Tool is super simple to use. Just input a keyword, choose your country and language and hit search. It then provides up to 750 keyword suggestions using the same method as Google Autofill. 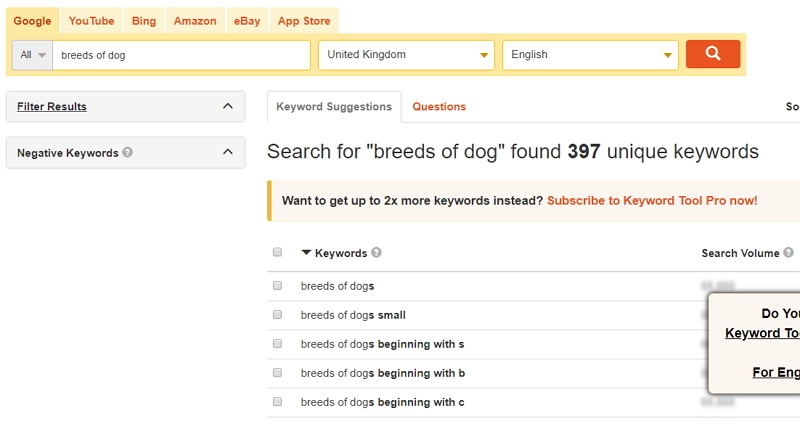 It also provides popular questions containing your chosen keyword. If you want to see average search volume for each suggestion, as well as CPC and competition, you’ll need to sign up for Keyword Tool Pro. But, the free version is still useful for generating content ideas and providing an insight into what your audience is searching for. The tool also has the ability to search not just Google for ideas, but Bing, Amazon, YouTube, eBay and even the App Store for free. Ahrefs has long been a reliable tool for analysing backlink data, but its Keyword Explorer is just as good. It goes far beyond just providing average search volume for your chosen keyword with metrics such as keyword difficulty, estimated clicks and global volume, as well as search suggestions, SERP position history and an overview of what the SERP currently looks like for that term. Given its backlink data, Ahrefs Keyword Explorer also suggests how many backlinks you’ll need from different websites in order to rank in the top 10 for that keyword. It also provides a ‘parent topic’ for your keyword, which determines if you can rank for your chosen keyword while still targeting a broader term on the page – handy for establishing closely related terms. The only downside of Ahrefs is nothing is free, but it is well worth a subscription if you’re in the SEO sphere. KWFinder incorporates several features from previous tools we’ve discussed, such as keyword difficulty, SERP overview, Google Autofill and suggested questions, but it only allows free users up to five searches a day. Regardless, KWFinder is clean and easy to use, providing a useful search volume trend for each keyword so you can map when it is most popular. 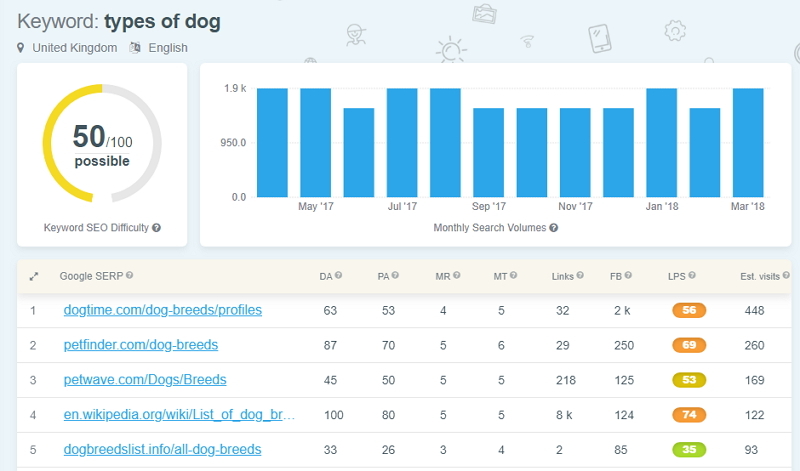 It also incorporates Moz data into the SERP preview, so you can see the domain authority, page authority, link profile and more, of each listing – good for knowing who you’re up against. Answer the Public is a brilliant tool for generating content ideas. Simply choose a language, input a keyword and search for questions. It uses every type of question you can think of, such as ‘why’, ‘how’, ‘where’, ‘can’, and so on, and formulates suggestions including your chosen keyword. It provides a great insight into the colloquial language used in search and often presents some surprising ideas! The tool also uses your keyword to suggest prepositions, as well as comparisons and related keywords. What it doesn’t do, however, is provide the average search volume for each. But, it is one of the best tools for generating ideas, which you can then put into another tool like Keyword Planner to establish the search volume behind it. A nice feature of Answer the Public is the way it presents data. Each suggestion is shown in a spider diagram, which you can save and use in the likes of presentations. If the large diagram is too daunting, you can view one of each individual question or just as bulleted data. If you want to get an edge on your competitors, there’s no better keyword tool to use than SEMrush. Simply input their URL and you’ll be presented with the keywords they rank for organically, as well as any paid keywords they are targeting. This will allow you to evaluate your strategy and work out what, if anything, you need to change. 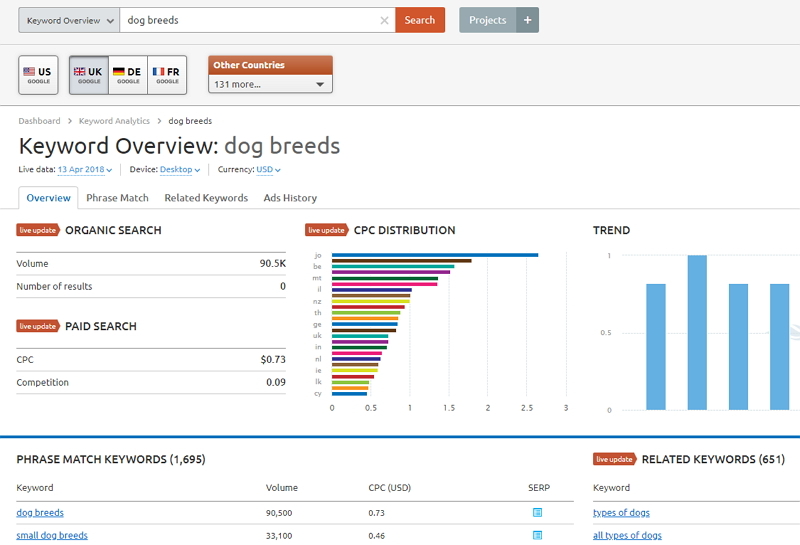 SEMrush also have a Keyword Magic Tool that is still in Beta phase. Despite this, it is still a decent tool that has a tidy interface and all the data you’d expect, such as average search volume, CPC, keyword difficulty and more. What sets it apart from the crowd is the advanced search criteria that can save you a whole lot of time. You can input things like volume range, word count and competition level to help you find the right keywords to target. However, you’re limited to how many searches you can perform before you have to pay. Last but by no means least, is Moz’s Keyword Explorer. 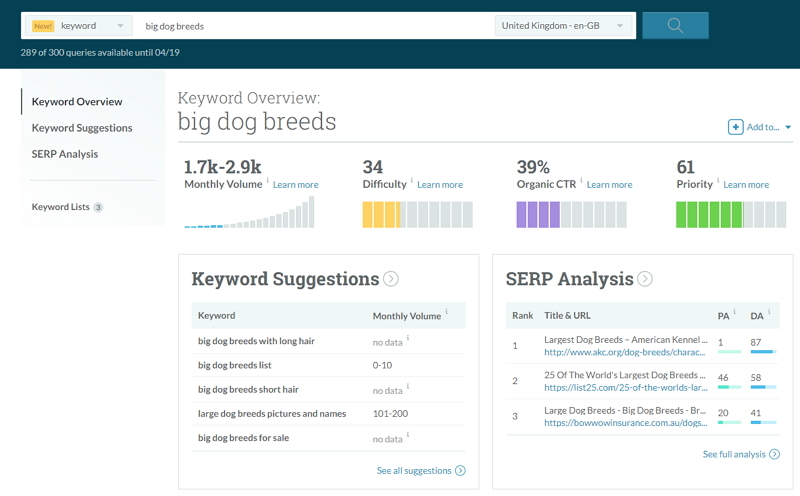 Unveiled in 2016, this keyword research tool is perhaps the nicest looking of all with a clean and colourful interface that is easy to navigate. Input a keyword and you’ll be met with an overview that includes a ranged monthly search volume, keyword difficulty, organic click-through rate and priority, i.e. 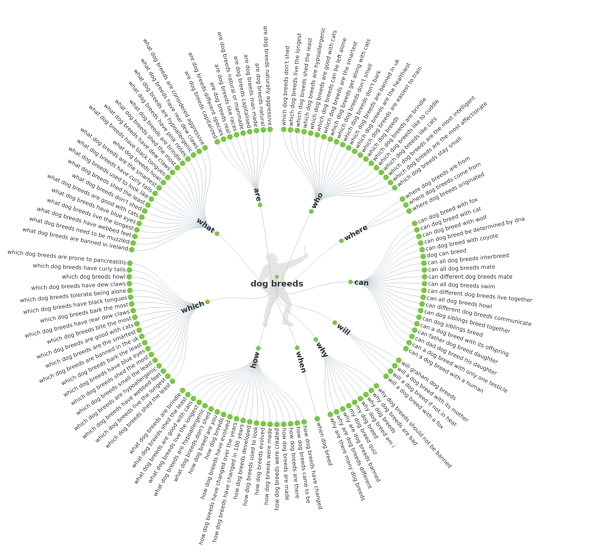 what keywords you should target based on the other metrics. But, unless you want to upgrade to Moz Pro, you are limited to 300 keywords each week. Keyword Explorer will also provide keyword suggestions, but goes a step further by allowing you to filter what is displayed. For instance, you can choose to show only suggestions that feature your keyword or ones that don’t, so as you get some broader ideas. It can also show related topics, questions and even synonyms – clever, right? As it is Moz, the SERP analysis shows the backlink data for each property, as well as page and domain authority. This is arguably more reliable than KWFinder, as it’s straight from the source. Keyword Explorer will also tell you what the right column of the SERP features, if anything, and what breaks up the search results, e.g. news articles. Keyword Explorer is also good for competitor analysis, as you can take a closer look at how you rank compared to others. Input up to three URLs to compare ranking keywords, positions, page authority and domain authority. It will also show you the ‘ranking distribution’ for each, i.e. how many keywords each has in positions 1-3, 4-10, and so on. You can also see where there is overlap in ranking keywords, so you can see where you appear for the same terms. We’re spoiled for choice for keyword research tools in 2018, but most require a subscription of some sort to get the full benefit of them. If you’re serious about nailing down a strong content strategy, investing in one of the many tools we’ve covered is well worth your time. Of course, that doesn’t mean the free tools out there like Answer the Public aren’t helpful. In fact, we recommend using tools like these alongside a paid service to conduct the most comprehensive keyword research possible. But, you don’t have to manage your SEO strategy alone. Let us perform a free SEO audit on your site and guide you on areas of opportunity – we’ll even look at your competitors, so you don’t have to! I’ve always been a devoted fan of AnswerThePublic. It always perfectly helps to understand the audience for which I write. But then I switched to K-meta Suggestion tool. It also collects a lot of question suggestions that people often are looking for and gives much more results than other tools. Bonus it that many keywords are with metrics, so I recommend to try. I absolutely love the Answer the Public tool! I am super – visual when it comes to ideas – so this webbing view helps. I love the guy who says aw-c’mon on the home page too. He’s a hoot! Hello! Greetings from Keyword Tool. Thanks for the mention 🙂 Also, just wanted to let you know we launch the prepositions keyword feature which comes with search volume in the Keyword Tool Pro version. Great summary writeup!